Today I am thrilled to have the opportunity to share more scheduling details with you regarding our upcoming Stamp-a-faire event on Saturday, August 24th. You can also get busy on making some special treats for the following day! Below you will find a special download containing favorite recipes from many of the Design Team members, all in recipe card format for you to print, cut out and save! I asked these lovely ladies to share their tried & true recipes for a crowd, so you KNOW these are gonna be good! August 24th OFFICIAL STAMP-A-FAIRE DAY! All of the challenges provided throughout Stamp-a-faire day will function much like our weekly Make It Monday Challenges. Each Stamp-a-faire Challenge will have a coordinating InLinkz list for you to share your projects using your favorite photo-hosting site (Flickr, Photobucket, etc), gallery or your blog. Each list will be open until noon EST, Monday, August 26th, so you will have ample time to particpate and photograph your projects. A winner will be randomly selected from each challenge to win a $25 gift certificate and announced on that Monday too! We provided an outline of basic supplies HERE that you can take a look at when gathering everything you need. Grab your cup of coffee and click on over here to download a free batch of color scheme and sketch recipe cards. You will be asked to select one color card and one sketch card that appeal to you. Then “bake” the two together and whip up a quick and easy card. A good way to get the creative juices flowing. An InLinkz list will be provided for everyone to share a pic of them holding their completed project, or potentially a photo/video of themselves arriving at their destination, how their day is starting, their set-up, the group of people they have getting together or anything else regarding the kick-off of Stamp-a-faire day! Various team members will share all the basics of tea staining different materials to incorporate into paper crafting! This will include tea staining muslin fabric and our felt, playing around with coffee and a paintbrush and even using kool-aid to create colorful “stained” embellishments! Learn how to create beautiful embellishments from Paperclay using dies and stamps. Paperclay is a unique clay that can be rolled thin, die-cut with our dies and allowed to air dry to harden. There is also a new Delight version of this clay which dries to be featherlight. Coloring mediums can be kneaded into the clay to start with to tint it. Stamps or impression plates can be pressed into the clay to add pattern or texture. After the clay piece is dry, it can be painted or clear coated to have a glossy finish. The finished pieces can be used as card embellishments, layout accents, home decor projects or even holiday ornaments & tags! 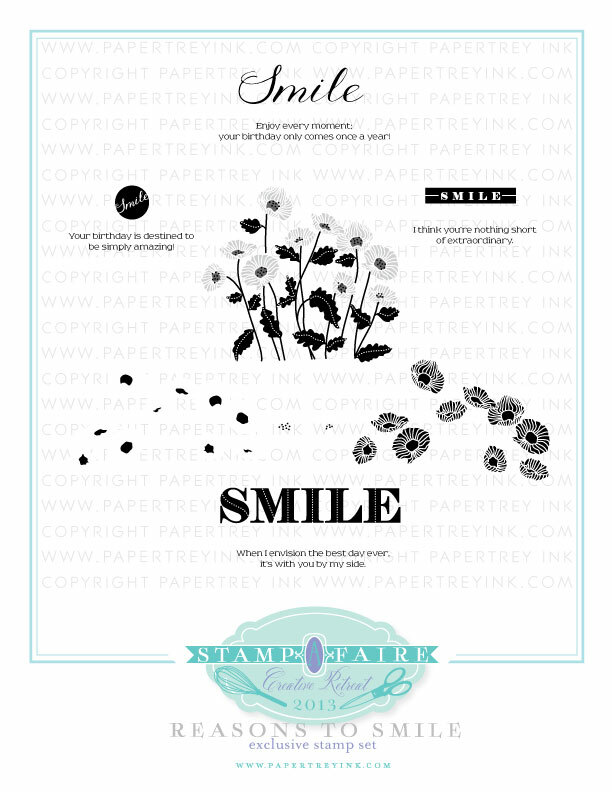 There will be a few different tutorials to show you step by step how you can incorporate this into your papercrafting! Recipes will be provided to create your own custom spray mists using our ink refills! Several design team members will showcase different ways you can use the mist on your projects. You’ll want to create this inexpensive alternative in all your favorite colors! NOTE: We have edited the supply list for this challenge and added rubbing alcohol to the list. We will be highlighting two amazing watercolor techniques that utilize sprinkles of salt to form resist-style patterns. So fun and easy that kids are encouraged to play along! 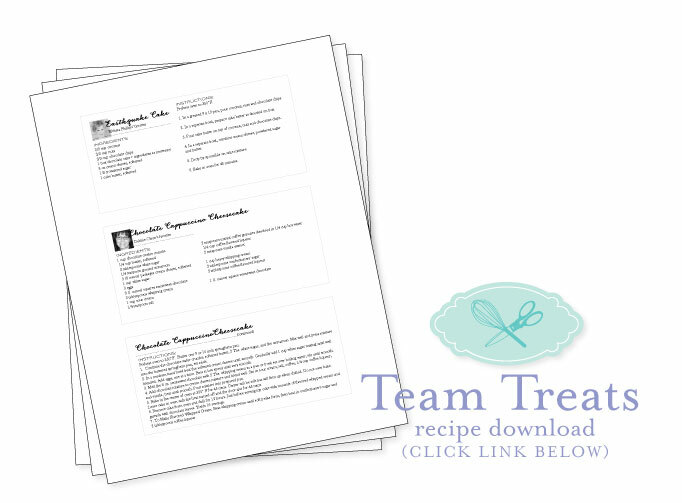 Customers select a color scheme recipe card from the morning Breakfast Bake & Take download provided earlier in the day. You will be challenged to incorporate the gallon, quart, pint principal taught by Betsy Veldman into a card of your own. Several Design Team members will showcase projects they create using the skills taught here. We’re bringing back an old technique and giving it a fresh and modern twist! Several team members will showcase shrink plastic projects and show you how to create unique accents for paper crafting projects, jewelry and more! We were excited to share a brand-new stamp set with you that won’t be officially released until September 15th this year, but was made available early to those who purchase a Stamp-a-faire kit. “Scent-imentals” is a collection of images and sentiments all geared towards creating scratch & sniff cards. At this time we will share a technique video that will show you all the ins and outs of using this new stamp set and creating scratch & sniff cards in general. You’ll see how you can use mixes made with everyday kitchen ingredients and clear embossing powder to create unique scratch & sniff cards. Free recipe card downloads for the scratch & sniff combinations will be made available that day. A limited list of supplies is provided below and customers are challenged to create a project just using these supplies. you can use any stamps that you wish. you don’t HAVE to use all of these supplies, but you cannot use anything that is not included on this list (except for a neutral ink, like white, gray or black). we have provided Papertrey color names for some of the products above, but feel free to substitute other brands if necessary. Learn how to cover nearly any type of embellishment with our popular Prisma Glitter! Learn tips and tricks from the pros on how to add glittered patterns to our Wonderful Words die-cuts, creating your own glittered cardstock, adding glittered tips to flower petals, adding a glitter stripe to your favorite ribbons and even coloring the glitter with alcohol inks! Beginning today, August 19th, we will have customers post projects that they have created in the past that they felt needed just a *little* something; a project that needs a diagnosis for one reason or another. Customers should share their projects by utilizing the inLinkz list below. Each DT member will select a project to “remix” to and re-create the project using a bit of a different recipe, making changes that they feel benefit the project while staying true to your original concept. All of the team members remixed projects will be highlighted at this time and each of the customer’s who had a card selected will win a $25 PTI gift certificate. See the InLinkz list below to add your a link to your project that you would like remixed! I have one final surprise announcement for you today! In addition to all of the gift certificates we will be giving away for each of the individual challenges, we will also be awarding a Top Chef prize this year! On Monday, August 26th, after all of the InLinkz lists have closed for entries, we will be going through and making a list of the chefs that participated in all ten challenges (this is everything but the Recipe Remix). The participants that created projects for each challenge will have their names thrown in a hat and one lucky winner will be selected as the 2013 Stamp-a-faire Top Chef! Of course, you can’t have a title without a prize! The Top Chef will receive a $200 Papertrey Gift Certificate to spend however they choose! Now, how’s that for an incentive! As a reminder to ALL of our customers, Saturday, August 24th also marks the day you can earn the Stamp-a-faire exclusive stamp set, Reasons to Smile ($15 value). This stamp set will be available for free on Stamp-a-faire day (August 24, 2013) to all customers who make a qualifying purchase of $100 or more between 7am EST and 11:30pm EST, limit one per customer. Reasons to Smile is limited edition for this years Stamp-a-faire event. It will never be made available for sale. 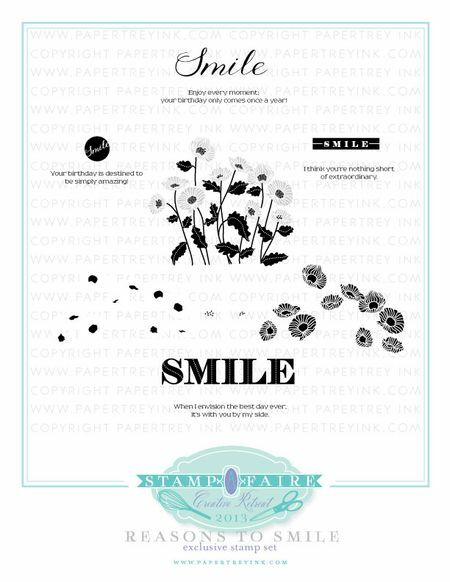 Reasons to Smile can be earned for FREE on Stamp-a-faire Day only, August 24th, as a freebie to all customers placing an order of $100 or more, limit one set per customer. Qualifying orders need to be placed between 7am EST and 11:30pm EST that day only. Also note that project samples created with Reasons to Smile will shared within a special blog post on August 23rd, so you have something to look forward to a bit later this week! We are looking forward to bringing all of you this amazing FREE stamping event! We hope to see you back here on Friday night! Below you will find the InLinkz list for the Recipe Remix Submissions. Customers should post a link to a project that they have created in the past that they felt needed just a *little* something; a project that needs a little remixing for one reason or another. Only one link per person please. Each customer who has a card selected will receive a $25 PTI gift certificate! Wow ! It looks like we are all going to have an amazing weekend. Thanks Nichole, all the design team and all the many helpers behind the scenes for making this happen. Betsy’s Addictive Corn Dip – how long and at what stage do you bake it? It has preheat instructions but nothing about baking it… sounds delish! Totally my error with Betsy’s recipe card. Her dip is not baked at all, just refrigerated overnight. I apologize for the confusion! Thanks so much for all the effort that’s gone into the Stamp-a-faire day. I have converted times for Australia and will be playing along, although I will have to go to bed at some stage – your 7am start is 9pm my time! I’m so excited! We are so excited. We live on the west coast so you will be starting a bit early. Will the videos be available all day or do we have to watch them live? The videos will be available permanently, just like Make It Monday videos! We look forward to seeing your projects! Well you all have done it again! Jam packed day and night full of fun, inspiration, and jolly good eats! Mixing bowls standing by! Can’t wait! One question, is the salt regular sea salt or rock salt? 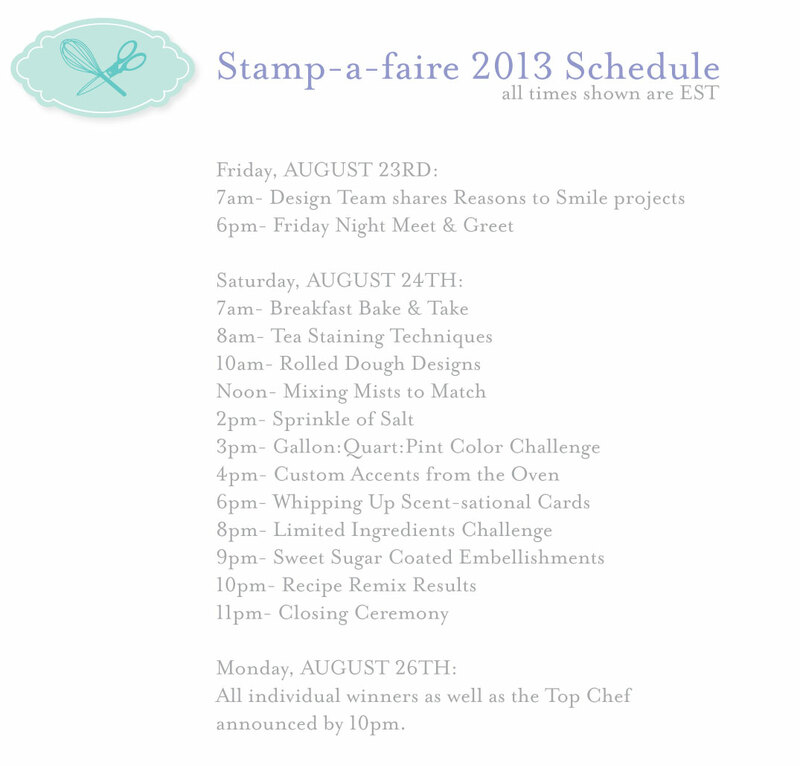 I am so excited Stamp-a-faire is online this year. I have other things going on Saturday so I am very excited the videos will be available after Saturday =) I plan to be there off and on during the day. I don’t have all the supplies needed and we don’t have a craft store nearby – closest is 100 miles away; so I will be improvising as much as I can. And, I’m going to make some of the treats for the other things we have going on that day. Can’t wait!!! Hi Nichole, one question…will we have to add the Reasons to Smile stamp set to our order or will it be included automatically? Thanks! Looks like fun!! I just realized the event is this weekend!!!!! Looks like so much fun!…super busy with family activities this weekend but I hope to pop in and check out all the kitchen capers! Have a FEAST of FUN ladies!! I’m not seeing the InLinkz List for the Receipe Remix Submissions. Am I blind or has it not been posted yet? WOW, lots of FUN activities! On our order on Aug. 24 do we add “Reason To Smile” to our order or will it automatically get added to our $100. order? How do I get the items for this event? It seems there is a prepared box to purchase? Thanks for all the hard work behind the scenes to make this such an incredible event!